Poles and other Slavic people, Soviet prisoners of war, Jehovah’s Witnesses, gay men, some members of the clergy, and others. 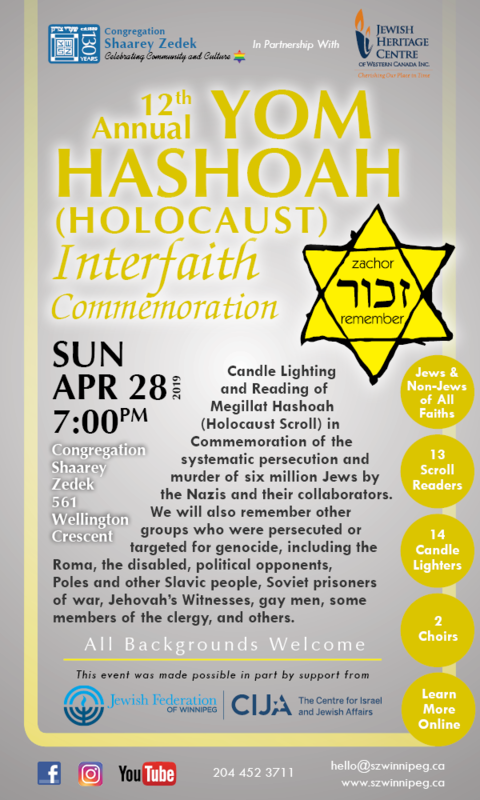 Brought to you by Congregation Shaarey Zedek and the Jewish Heritage Centre of Western Canada. This event was also made possible in part by support from the Jewish Federation of Winnipeg and CIJA (The Centre for Israel and Jewish Affairs). ** In addition to the volunteers above, we will also have Jewish and Non-Jewish candle lighters, and others participating in various roles.